Is There Comfort in Depression? The question continues to puzzle me: How did I get over depression? That deep change began about 18 months ago, and it’s been a year since I knew for sure that something fundamental had shifted. The nemesis wasn’t after me anymore. In fact, I couldn’t find that thing anywhere near me. After so many temporary recoveries, I was cautious about saying – or even thinking – that I could finally be free of it. So I just kept on moving through each day. That was fine for a few months until I finally had to admit that everything was different. I felt fully alive again. Why did it take so long? I struggled with that question for a while and got nowhere. Then, I woke up one day and realized that at some point I had become strangely comfortable with depression. Even while working hard to get over it, I had also been working hard, half consciously, not to change. That was a thought I did not at all want to accept, but at some level it rang true. There had been a certain comfort in when I’d figured out that depression was far more pervasive than I’d ever imagined. The condition accounted for so many of the problems I had long taken as proof of how empty I was. Knowing myself as a depressed person was a big step up from knowing myself as a worthless one. There was a big risk in the change I would have to go through to find another me – a recovered one. Even though I yearned to be free of the suffering, emotionally I was telling myself: I’m not ready yet. I didn’t understand depression all at once. There were key moments when I suddenly grasped new dimensions of the condition. Each of them helped seal me into a depressed – and passive – identity. The first was simply finding out in my twenties that part of what I was going through was called depression by a bona-fide psychiatrist. The word wasn’t just a general part of my vocabulary anymore. It was official. As far as I understood at the time, though, that simply referred to periods of despair when I had suicidal thoughts and no energy to move. The psychiatrists I saw shared a then common attitude that depression was a side issue. The important thing was to get to the depths of family history, trauma and all the hidden influences that had shaped me. In that context, depression could even be useful as a stimulus to probe more deeply into the real issues. Nobody talked about medication or any other special treatment for it unless I was in a full-blown crisis. Much later, I realized that depression was a more serious and pervasive problem than I had thought. It may seem strange to say that, but I had convinced myself that the dark moods were a relatively minor problem. I thought I was highly functional most of the time, even when it became obvious to everyone close to me that I was often in trouble. Depression, I now found, accounted for problems of mental clouding, lack of focus, slowed thinking and talking, intense anxiety and many other symptoms. The relief in that moment came from understanding that I wasn’t the only one going through this and that those mind- and will-cripplers weren’t evidence of my inadequacy as a person. Instead, all these problems came together in the illness of depression. The next eye-opener was that periods of depression had no cause in immediate experience. I believed it was the background condition of my life. It was always there and would keep on returning. In the 90’s, a doctor let me know that new drugs could effectively treat depression, and for the first time I regularly took medication. The drug was called Prozac, and I felt great for a few months. Then it stopped working, and I was off on a long journey to find the right drug with the promised cure. I never found it, but now I was looking outward for medication combined with other treatments to take care of the illness. Then I found there was a term for the disappointing results with all the treatments I tried. They were not ineffective. I was the problem because I was treatment resistant. Now it seemed inevitable that I would never get away from depression. My version was self-sustaining and could not be treated successfully. Later I discovered my full DSM diagnosis and the number assigned to it, and I felt more settled than ever into a life built around a struggle with depression. There was a strange security and comfort in having this bad news. I knew, or believed, that I had found the answer. I was a depressed person for life. That’s who I was. It was painful, to be sure, but this identity gave me answers for everything I went through. I had constructed a home where I lived with depression. We were on intimate terms. It made me desperate at times, and I couldn’t understand how it could keep returning and ruining so much that I tried to do. I’d scream at it, but always felt – that’s me, and that’s it. Nobody can end it, so I have to accept a life of constant struggle. That certainty was my comfort. But another mind-flip suddenly made life much more complicated. There was a different way to look at this. How could I possibly get back to real living if I didn’t put myself at the center of recovery and stop waiting for “treatment” to take care of me? That was the beginning of real change, but the idea was both empowering and scary. How would this work? Why did I imagine that I could trust the progress I might make? Would this turn out to be false hope once again? At times I was a determined warrior steadily advancing. At times I was afraid of the future and made a cautious retreat. My fallback position wasn’t so bad. I’d read many stories about people who had come to terms with lifelong depression, even finding a spiritual meaning to their lives. Surely, I could live with that. But I kept at. I may never know exactly how or why I changed for the better and for the first time trusted recovery. But I do know how I got out of the trap of comfort that might have prevented me from trying. How do you know you have overcome it? I “overcame” my depression as well, only to find myself, 3 or 4 years later, slowly being dragged back to the void that consumes the mind. Be very careful with early celebration because life is quick to teach lessons. I hope you fare well in the next few years. What does one do if your Mental Problems/ Injury was cause by “Medicine” forced upon you as a child. This “Medicine”, suggested by an untrained goverment official, permanently effected my over-all mental condition as well as my body. I refuse to take any type of drug to this day, and have suffered my entire life after the fact of taking this perscription. My mind and life is at best….. Anyways, so how does one work with a system that caused the damage? Frankly seems like the system is corrupt or just none carring. Kids should not be forced to take any prescription just so schools and parents can be lazy. Makes me wonder if the world needs a monster to wake it up 🙂 A real monster, one that scars the society that made it, forever. Say what you will, but my mind was raped by doctors. Willfully or not, does not change the damage the system caused. Kids are getting powerful psychotropic drugs at incredibly early ages now, even 2 or 3. I can’t imagine how careless doctors are in giving these drugs to kids whose brains and personalities are still developing. The psychiatry field has also broadened definitions of mental disorders to include thousands of kids in bipolar II and other categories on the basis of too little evidence, I believe. The worst of it is that by-the-book screening often starts with school counselors who always seem to be on the lookout for any sign of aberrant behavior. They label children despite their meager training and start the process of moving them toward medication and a diagnosis that can be perpetual. I’m so sorry to hear what happened to you. I don’t know the answer to your question on how to deal with this system except to educate parents, challenge school assessments and try to get more public attention on the issue. John, thank you for sharing your experiences. I have struggled with severe depression for years… before I even knew that that was what it was. There is some sort of comfort in a diagnosis; it’s like once you know, you begin to rebuild your life around surviving and thriving despite the “diagnosis”. I hope that you continue to move forward through life with peace. I agree that a diagnosis can be a relief – it helped me identify as common symptoms so much that I had blamed myself for. After a while, though, I tried to convince myself that only therapy and medication could cure me. I was not so quick to take charge of my recovery in order to get past the diagnosis. Thank you for describing that part of your experience. I hope that you too have found relief from depression. It has been a while since I last visited your page (mostly due to a busy relocation), but it feels somewhat appropriate to come back and read your latest piece of writing. Again it feels like what you have written as struck a very personal note. My recent experiences with depression have been ones where I seem to go through a collection of thoughts which draw out a timeline about my ups and downs and how I have seemingly “recovered”, and how at the the same time how much damage this illness has done in my life. Within me I feel like I am heading towards a place where I need to put myself at the centre of my recovery, acknowledge and accept this fully, then be disciplined to keep reminding myself why I am doing such work. Within your post and in reply to what some others have said, this might be one of my biggest hurdles with the consistency of my “episodes” and effectiveness in my recovery at the moment…Giving myself a permission of sorts to make this the most important work in my life. I hope what I wrote was able to be interpreted in a somewhat clear manner. It is great to be back and be welcomed by your writing again John. Hi, Sean – I’m so glad you’re back. A timeline helped me to get a clear sense of the cycles I went through – as well as the losses during those down periods. One thing that shortened my periods of recovery was the expectation that it wouldn’t last, that depression was always in the background and would reassert itself with no particular trigger. In that respect, I agree with one of the principles that went into the development of Positive Psychology – that is, the role of expectation. Definitely keep reminding yourself – it is within your power to change your stance and expectations about depression. That’s not the whole answer, but it’s a major part of it, I’m convinced. This is a topic that is of interest to me, how we can feel comfortable in certain “bad” situations. When my father (who, you may remember, has treatment-resistant depression and has been depressed on and off, mainly on, since his early twenties) was here in September, we were talking about this, how sometimes you can get stuck in depression. I’m not sure if he would use the term ‘comfortable’ and I hesitate to say that he can push himself out of it –but I think that if he put himself at the center of his recovery, and maybe put some childhood issues to rest (again, as much as anyone can — there is a way to learn how to live with them), things would get better for him. I’m glad those days feel like they are behind you. I think you’re right about your dad putting himself at the center of his recovery. That was really important for me. And exploring the childhood patterns that have been carried into later life has been a source of great insight and relief to me. That process started for me in my twenties so it’s been slow, to say the least, and all by itself hasn’t done the whole job for me. But it’s critical to do that as part of recovery. That’s so good to hear, Jaliya. I look forward to hearing more about the changing of habits. That gets to the core of depressed behavior, I think. “Treatment resistant” don’t you just love how it’s always the client’s fault?! I hope you write more about that path of real change. Why some people make the change and others don’t is incredibly interesting and perplexing I think. And it doesn’t seem related to the depth of suffering – some people with mild suffering stay with it and others don’t; others with really awful suffering stay with it and others don’t. Thank you. I have to keep writing about that path of change for my own understanding. 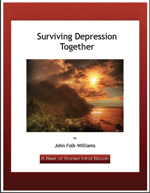 Depressed for 50 years and then it’s gone – what happened this time as opposed to all the other times I was determined to get rid of it?? That’s what I keep asking – a much nicer question to deal with than others I’ve asked, of course. I suppose I may never have an explanation in terms of cause-effect, but I can live quite well without it. I think that’s a highly important factor of depression. Once you try to start fixing little things that went wrong years ago you forget the big picture. That what has happened in the past no longer matters. What matters is the future. Corey – though it’s years later, your comment really resonates with me on my own journey of healing. My therapist keeps reminding me that I spend so much time in the past, and there are a lot of mistakes we just can’t fix (small or large, and again, a lot of it is subjective too). I think it’s a good practice to reach out to those you think or know we’re affected when times were dark, but I’ve been known to take it too far – something therapy is so great for. We might be surprised how many in our lives don’t hold anything against us and understand. Also, It might be more about taking those perceived mistakes and taking responsibitly, and practicing new approaches to similar situations. All of this is hard, but I think doable. Our futures matter. Hey John great article. I have been through mild depression myself. But my happy ending came in a beautiful girl I met and married. I really hope your life takes a turn for the better. Thank you. That is a happy ending! Getting married was a huge turnaround for me as well. Depression has a way of coming back, but the marriage has been the greatest part of my life. Writing award for you at my blog… with respect. It’s a real honor to be recognized by you and placed in the company of so many fine bloggers.